Image: M_a_y_a/Getty Images. Design: Ashley Britton/SheKnows. With the weather outside turning frightful, a vacation to someplace warm this holiday season might sound so, so delightful — in theory, at least. Although many parents do choose to travel during the winter holidays because kids are off from school, this actually may be the worst time to take a family trip — when you take into account cost, crowds and all that family pressure to boot. Dr. Charmain Jackman, a child psychologist from Massachusetts, explains to SheKnows, “Holidays bring stress in many forms — reliving unhealthy family dynamics, finding the perfect gifts for loved ones, going over budget, dealing with long lines and grumping masses of people…” Sound familiar? This is all to say that, while going on vacation to decompress during this festive time of year may sound ideal and relaxing, it can also have the reverse effect. What’s the best way to avoid the holiday travel stress pile-on during this already hectic time of year? Why, staying home, of course. Here’s why you — and your kids — may well want to consider swapping out Grandma’s house for a staycation this holiday season. In 2017, AAA forecasted that 107.3 million Americans would travel by plane, train or other transportation during the holiday season, a record high for that time of year. The increase in travelers during the holidays means an increase in air and roadway traffic. “Just about everyone is heading somewhere during the holidays, so all forms of travel will be packed,” says Jackman. “Travelers can expect delays or even cancellations, which can cut down time spent on a well-planned vacation.” Parents traveling with children, especially young ones, may become exasperated by the sheer effort to get to where they’re headed. In addition to the crowds, family travel can be stressful simply because of the expense. Flights and hotel prices increase during the peak holiday-travel season; then, there’s all the gifts and holiday entertaining that may have already put a strain on family budgets. And spending additional funds on a whole-family vacation? That can add exponentially to your financial burden. Plus, if something goes wrong (delays, bad weather, a child gets sick), the vacation can wind up being way more frustrating/upsetting than fun/relaxing. As for the kids? They may actually be thrilled not to travel during the holidays. “Kids today have so much pressure and stress that prior generations didn’t experience,” explains Serin. “Many kids have hours of homework a night and multiple activities every day.” Staying home and being able to sleep late in their own beds? And then hang out in a leisurely manner with no scheduled activities?? That may be exactly what kids are dreaming of this holiday season. If you find that your kids or partner express disappointment at staying home this year, Serin suggests using some of this blissful staycation time to plan a few future travels — even if it’s just a romantic overnight at a hotel for your anniversary. There are plenty of ways to have a great winter staycation for the whole family. First of all, if possible, parents should consider taking some time off work to make the staycation like a real vacay. Sure, it might seem like a waste of vacation days just because you’re not traveling — but it’s not. Even just a few days off can make your staycation feel legit. A good vacation should include a mix of activities as well as downtime. Have a family meeting and let everyone have input on what to include on the agenda. “Staying home does not automatically mean that you will be less stressed,” Jackman explains — so “be sure to commit to a relaxation plan.” Have all family members promise to disconnect from their phones, computers and social media for some time each day to avoid outside distractions. 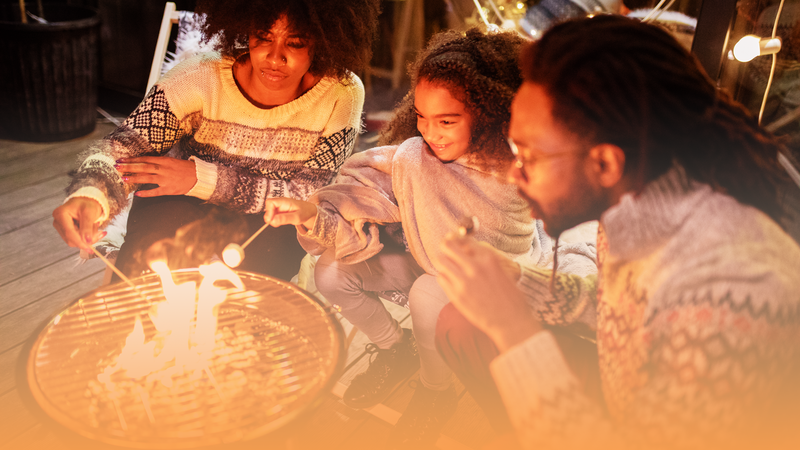 The bottom line, Serin explains, is that “if you go on ‘vacation’ and come back and need a vacation, it wasn’t a vacation.” So while a staycation may not be as Instagram-worthy as traveling to an exotic island, it could wind up being the best possible way to spend time with your family over the holidays.